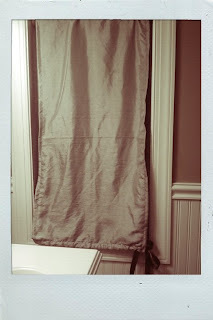 For the first day of 30 Days of Creativity, I made a curtain. We’ve now been living in this apartment for almost six months, and until today we had a towel hanging in the bathroom window. The window is an uncommon shape, and for some reason there is already a curtain rod built into it. It is fixed there, so we weren’t able to remove it to string a new curtain on, like a normal curtain rod. I’m told that the previous tenant was a carpenter, so I’m blaming him. Anyway. 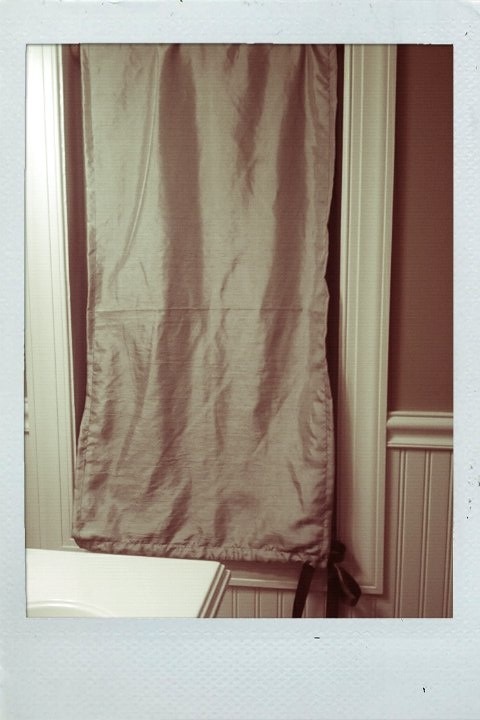 I finally decided on a design for our bathroom curtain, and, after several intimate moments with the seam ripper, constructed this. Excuse the poor photo quality. It’s kind of a hard thing to photograph. Because the curtain rod was so annoyingly attached, I had to come up with some way to put the curtain up without being able to put it directly on the curtain rod. 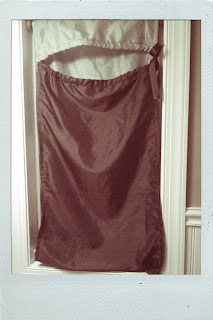 So, I sewed together two panels of fabric, one green, one brown, and made little tunnels on the ends. Then, I strung ribbon through the tunnels, and tied it together. This way, we’ll be able to pull the curtain off to the side and tie it back. You can see it better there. It’s not my most spectacular creation, but it sure is better than the towel that’s been hanging in the window. And it can change color depending on my mood!